Colby Cosh has taken to task those who chastise Alberta for not "being more like Norway" ("Norwailing"). Eventually, they return to electing the same PC governments that wasted the money—on garbage like education, medicine, welfare and roads—and resume spending their own share on consumer purchases they will later denounce. We stand in the same relationship to the selfish past that future generations do to us; we wish the saving had begun before we were born. That would have been convenient, assuming the money was not invested unwisely, squandered for political ends or just stolen. So why should lottery winners born in 2050 have the benefit of the oil our agents extract now? But most importantly, he also points out the obvious comparison issue between Alberta and Norway. Alberta is a province in Canada, Norway is it's own country. Norway, you’ll notice, is the indigenous home of a nationality. Norwegians, even those without children, perceive their oil fund as a sacrifice for their collective posterity. Alberta has awkwardly open borders and little national consciousness. As an Albertan, I cannot see the point of saving for some invader’s dotage. The "Alberta isn't a country" point/argument can be a subtle one, and ironically it's the self-appointed job of folks like me who want Alberta to be it's own country having to explain to the same people who endlessly assail and belittle our position that it currently isn't the case. Another major difference of note, which Cosh only brushed over, is that of Equalization Payments. Since 1966 Alberta has paid into the federal equalization transfer program† every single year. This sums up to 243,554 million dollars (in 2004 dollars) up to 2002 alone. Let's just say that after 2004 it didn't exactly get better. † To quiet down the leftist ruckus from folks like @procedurepols, yes yes the Alberta provincial government doesn't directly pay any cash to other provincial governments. That's mostly a distinction without a difference though: Albertans still get bilked for this, that's still money flowing out of the province and into other provinces, making it unavailable for potential Alberta government revenue (which would allow more money in the provincial coffers). In any regard, it's intellectually bankrupt to ignore this when comparing Alberta and Norway. Comparing Alberta's "savings fund" with Norway's fails right then and there. Alberta lost almost 36 billion dollars in 2009 alone. If Alberta promises to start a Norway-style fund, will the equalization program be suspended? 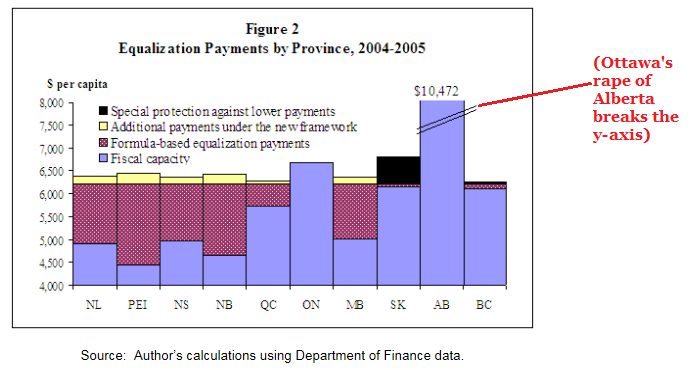 The province lost about two-thirds of a trillion in equalization payments since 1966 (and, indeed, since ever since by May 1969 Alberta was officially worse off under equalization and the train has sailed away from us ever since). That's 2/3rds the value of Norway's fund even before you factor in the economic benefit of keeping that money in the Alberta economy (even if it's just going to local government programs it has a benefit, if it's kept out of the government's coffers that benefit is expanded at least a tenfold). The full economic costs of Alberta being part of Confederation is hard to estimate, it's definitely not lower than the bare dollar losses of the Equalization Formula. It's also worth noting, of course, that far-left government spending plans by Premier Getty, the Alison Redford of his day, left Alberta in a heavy debt situation that required King Ralph to come and save us. The same far-left louts who cheered Getty's overspending and cheered Stelmach/Redford's overspending are now upset that the revenue from oilsands taxation was spent on social programs? I know, Cosh made the same point, but the better point to be made here is that far-left politicians like Redford or Notley spend every dollar they can get their hands on and then some. Giving them more money doesn't seem like a particularly wise investment. And of course, there's the economic spillover of oil-related industries that don't happen to nearly the same degree when the resource extractors (the companies who do the actual work) capitalize on the activity rather than greedy government workers (the people who don't do any work and just tax those who are productive). Andrew Leach notes that this works hand and hand with "diversification", another demand of the Norwailers (who ignore that it doesn't seem to be happening in actual Norway). How do you diversify? By investment capital. How do you get investment capital? Easy, by letting "evil corporations" profit off of the oilsands. Which is, of course, what Alberta has been doing. The fact that the companies also had to invest in research to get Mother Nature's Oil Spill out of the ground in the first place isn't a non-factor either: these companies spent decades and billions investing in Alberta, and it seems to be the height of temporal assholery to now decide they get rewarded with a punch in the gut courtesy the far-left in Alberta (who hate them and think they're ruining the planet to begin with). These are jobs, not just swamper jobs but jobs in white labcoats with advanced degrees in Organic Chemistry. The same people who keep Campbell Scientific building new facilities. The Norwailers tend to demand specific subsidies for their union buddies which is oddly enough another thing Norway itself doesn't do: they haven't built refinery capacity to match their crude production, and have rapidly increased up the list of crude-exporting nations as a result. Of course, the Norwailers could be onto something. Hey, Norway controls immigration, can Alberta do this too? If we impose strict white-only immigration to the province and return us to safe-haven status, maybe this "be like Norway" thing might be worth it!